Stalin Saravanan is a name to reckon with in the cinema industry in and out of Tamilnadu. With 20 Years of experience providing high-end visual effects, animation, gaming, stereoscope and training to all strata of the entertainment industry, he has executed more than 300+ International & domestic projects including VFX, Stereoscope, CGI Animation and Gaming, etc on The State –Of-The-Art of Digital Media heading projects, supervising Visual Effects Supervision both On and off Site, Creating new concepts in addition to Matte painting, Digital Composting, Animation, AD Commercials, Pre Viz, Stereo Scope , CGI Animation films and Commercial Etc. As a certified Trainer for Advance Visual Effects & Animation Course he is creating new heroes on this field. His International Projects include “IRON MAN 3”, “The Oblivion”, “300 Part2”, “EXPENDABLES Part2” , “THE SWIFT”, “THE HELP” “I AM NUMBER 4” “LAND OF THE ASTRONAUTS (The black Limousine)” “DEVIL’S EXECUTIONER” “DEAD MAN DOWN” and few More. Speaking about Stereoscopic Projects like “Harry Potter and the deathly hallows”- Part7, Part 7B, 500 shots of Stereo conversion works were delivered. In “Narnia- Voyage of the Dawn Trader”, Stalin handled all major sequences for stereo depth conversion works. KASHMORA, BAHUBALI Part1, THERI, Shankar’s “I”, “CHENNAI EXPRESS” “POLICE GIRI” “ROBO” “RA.ONE” “BODYGUARD’ “DABANGG” “WANTED” “MATTARRAN” “NANBAN” “SIVAJI” “DASAVATHARAM” “POKIRI” “NIPPU” and many such domestic projects turned out to be hits stretching the capabilities of visual effects in the hands of this to extremes previously unimagined. Computer generated imagery in animation films like Sinbad Beyond the veil of mists- USA, Blue Remains – USA, Pandavas- The five Warriors, Alibaba- Forty Thieves, Son of Aladdin, King of I – Warner Brothers set an entirely different standard to the very making of movies as such. And, lo and behold, Android Commercials, National Geo Channel “Marvi the Hammer” – German TV Series, TOKYO GAS- Commercials, Japan, GSK Medical animations- USA, Pothys TVC and more injected a sense of wonder into viewers thereby reinstating the fact that special effects had never been better or more crucial to the shows, films and commercials that we love. There's no debate about how straight-up incredible Stalin’s works are. More so, 500 and more have experience Stalin as their VFX & Animation trainer as he travels throughout the country meeting passionate wannabe animators. As Special invitee for future technology awareness programs in VFX & Animation, this man tries to impart knowledge on how to prepare themselves for a range of roles in the creative media and to make good productions great. As a guest speaker in institutes offering VFX courses across the country such as Orbit2013, High End In depth of VFX/Animation for feature films- Chennai, South Indian VFX & Animation Summit 2012, Organized by Animation Xpress and lot more, Stalin talks about industry oriented ideas and practices helping students gain a broader perspective and practical insights. During informal chats with students he shares his personal experience on what led him this far motivating them to look above and beyond hurdles. Colleges and technical institutions that offer workshops look up to this man to extend his helping hand because the name ‘Stalin’ seems enough to skyrocket the number of participants who get benefitted also by professional and social relationships. Stalin is a Prestigious Visual Effects Society member of “VES” Society – California Jury member – FICCI, Animation & VFX Awards 2013. Animation Guilt Network India also takes pride from having Stalin as one of their core members. He has played his role as a panellist, VES South India and as creative person & Jury member in art &sculpting workshop organised by IOB, Chennai. Receiving the artist & sculptor award from the Department of Art & Culture 2009 was just another feather to his cap. For someone who knows the list of awards he earned, it’s surprising to experience his simple humble attitude towards life. An award of recognition for LAND OF THE ASTRONAUTS at Santa Cruz Film Festival 2011 was indeed a breakthrough in his career though he got his first taste of success years back in 1999 when the movie PANDAVAS won the national award as the best animation film . 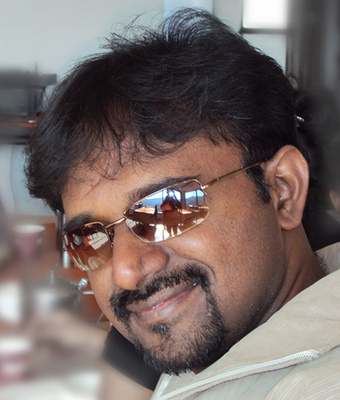 VARUDU earned him the prestigious Nandi award for best visual effects in 2011, the year which spelled magic decorating Stalin with national awards for best visual effects in movies as ROBO, DABAANG and SIVAJI “THE BOSS”. In 2000, OKADU won seven Nandhi awards, seven years after which DASAVATHARAM won seven prestigious awards, a simple reminder that ‘lucky 7’ is also the world’s favourite number. Nandhi award for best visual effects in the year 2006 went to SAINIKUDU. ALIBHABHA being nominated for the Oscar’s in 2003 as India’s first animation film wasn’t abracadabra but a part of Stalin’s sweat, determination and hard work. 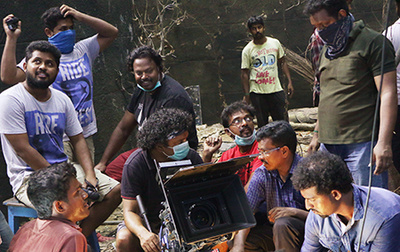 An appreciative number of testimonials speak volumes of his credentials as a VFX director. Few good words of thanks from Raymond McIntyre Jr - VFX Supervisor, Pixel Magic USA commending Stalin and his team’s efforts on the 55 minutes stereo conversion work for Harry Potter and the Deathly Hallows: Part 1 & Part 2 still seem to inspire him. ‘Cost-Effective Quality’ and ‘Timely Delivery’ of Stalin’s works have been recorded by Producer Cineville Santa Monica, California which is indeed an added motivation for his visual effects team as such. Arbazz Khan, Producer- Dabanng and Atul Agnihotri – Producer, Bodyguard have recorded their trust with Stalin and his team. After having achieved so much Stalin believes that he is still learning, has a long way to go, was pretty good at putting some hard work over the last couple of years and one of the things that’s helped him the most was testimonials from who’s who to help prospects overcome those “uncertainty” objections. Excellent Interview. Proud of Indian Techinician.